Straight off the back of Friday’s exciting finish in Quebec and Saturday’s tumultuous day at the Vuelta comes the Grand Prix Cycliste de Montreal. The action should hopefully be just as thrilling. 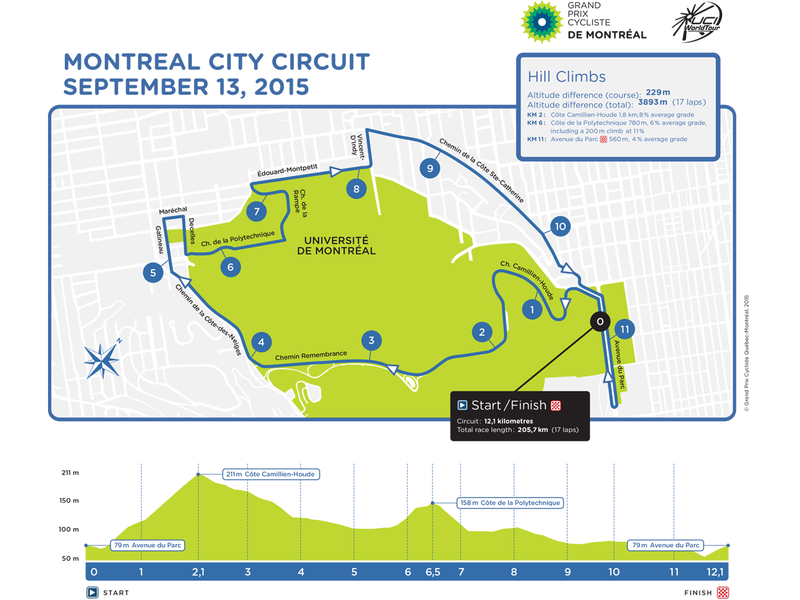 The race is held on a 12.1km circuit around Montreal, starting and finishing on the Avenue du Parc, with the riders completing 17 laps for a total of 205.7km. Despite being a city course, this race has never been won by a pure sprinter. It’s a tough, hilly parcours, with three significant climbs to help shed the fast men. The toughest climb is the Cote Camilien-Houde, a 1.8km ascent with an 8% average gradient. It’s the repeated ascents of this climb that will splinter the peloton. However, with the summit coming 10km before the finish line, it’s unlikely we’ll see a decisive move here. The second climb comes midway through the circuit. The Cote de la Polytechnique – so named because of its proximity to the university – is 780 metres long, with an average gradient of 6% – though over a third of the climb is a leg-sapping 11%. At its summit the riders attack Chemin de la Rampe, a steep descent with some tight technical turns. The last ascent is the least formidable (560 metres at 4% gradient), though as it ramps up to the finish line it could be the most decisive if there’s a bunch scrapping for victory. Because of the proximity of the two Canadian one-day classics, most teams bring the same squad to both. However, in the five years these races have been held, only Orica-GreenEDGE’s Simon Gerrans has completed the double (2014). He’s competing in the Vuelta a Espana and isn’t here to defend his crown, although Friday’s winner Rigoberto Uran (Etixx-Quick Step) will be hoping to match Gerrans’ achievement here. Former winner Rui Costa (Lampre-Merida) will almost certainly be up near the front, along with reigning world champion Michal Kwiatkowski (Etixx-Quick Step) giving the rainbow jersey a final run-out. Another former winner, Robert Gesink, (Lotto NL-Jumbo) has shown a return to form this year with his sixth overall in the Tour de France after a number of seasons dogged by illness and injury. Baroudeurs such as BMC’s duo of Philippe Gilbert and Greg Van Avermaet (BMC), Tony Gallopin (Lotto-Belisol) – both top ten finishers in Quebec – plus Katusha’s Alexander Kristoff (third on Friday) excel over this type of terrain and will be hoping that they are in the front group heading into final drag towards the finish. They’re all more than capable of handling short, sharp climbs. There are a handful of other grand tour general classification riders present, too, including Romain Bardet (Ag2r La Mondiale), Trek’s Bauke Mollema and Giant-Alpecin’s Warren Barguil. The shortness of the climbs means they’re all outsiders, but they could be in the mix heading into the last few kilometres. Finally, it’s worth noting the form guide and looking for other riders who finished strongly in Quebec to also fancy their chances here, such as Orica-GreenEDGE’s Michael Matthews (second), Cannondale-Garmin’s Tom-Jelte Slagter (fourth) and Lampre’s Diego Ulissi (fifth).